Pajar winter boots come from our Canadian neighbors in Montreal, and they know a thing or two about winter weather. 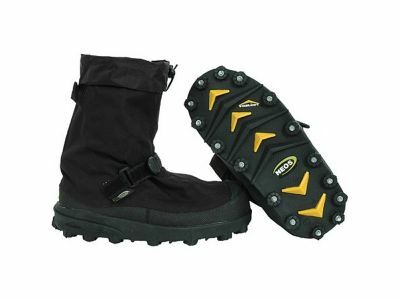 Their boots are sturdy, warm, and designed with fashion in mind. With boots that keep you warm down to as low as -40 degrees, your feet will stay toasty. We can also fit custom orthotics into your boots to keep your feet, knees, hips and lower back comfortable as well. The reason we have clients that come from as far as Grand Rapids, Michigan, is that we offer custom made orthotics made right here in Kalamazoo. Clients that have found the perfect combination of shoes and inserts often don’t want wear anything else – and that’s when we recommend Neos overshoes. We carry a variety of styles, so you can find one that fits your personality. All of their overshoes are waterproof and leak resistant, and the Voyager is equipped with spikes in the soles for great traction on ice. Of course, winter conditions can be dangerous no matter what we wear on our feet. Take care out there, and go slow until you feel secure. At Corey’s, our pedorthists want to get you moving, so come on into our stores and talk to a mobility expert. We want to see you active and enjoying yourself, no matter what Mother Nature has in store. Bundle up – feet included – and get outside to enjoy the beauty of our surroundings covered in a blanket of snow.